How Do You Know When You’ve Met The “One”? | holychick Be Fabulous, Be Fierce, Be You! « Is It Me Or… Is Kim Burrell Wearing Lingerie in Her Music Video Out of Order? As a single Christian young woman, often times thoughts of the “One” crosses my mind. I wonder what he’ll look like, what his personality will be like, how will we meet etc. The only thing I know for sure is that my “One” must be unequivocally sold out for God! No exceptions, no substitutions, no half stepping and no fronting about it! As my early 20’s are becoming a distant memory (we had some great times! ), and my “One” has yet to make his appearance, I’m beginning to get the side eye from everybody! Don’t you just love the why are you still single question? Side note: A friend of mine said that every time he goes to a wedding people ask him so when is it going to be your turn or they say you’re next! So he said the next time he goes to a funeral he’s going to go around and ask people so when is it going to be your turn or point to someone and say you’re next! LOL, he’s a hot mess. Either way I don’t have an answer to the why I’m still single question and even if I did I still have to wait on God’s time. People don’t seem to get that and try to match me with anybody just as long as the person is single. A friend of mine even told me straight out I know you’re not going to like him, but he’s single. WHAT!!! ! Not wanting to be closed minded I ask is he a Christian? She says I don’t know, but he’s funny. Lol, thanks, but I’ll pass! I am no where near desperate so why is everyone else desperate to hook me up. Relax everybody! This is not only my reality, but it is true for so many of my single friends, both male and female. The worse part is that when one person from the group gets blessed to change their facebook status from single to married, they act like they are now a part of an elusive secret society that only those lucky enough to have met the “One” are allowed membership. There becomes an unspoken divide between the have and the have not. While some people become stuck on stupid once they get married, there are plenty more couples who we singles can gain wisdom from. I enjoy listening to these couples rehash how they met and talk about how they knew their spouse was the “One”. Though all the stories differ there is always one commonality, PRAYER! Marriage is life changing and too important not to include prayer. Seeking God’s guidance can make the difference between truly meeting the “One” and making “One” of the biggest mistakes of your life! Recently I came across and article on Single Black Male discussing this very topic. It was very interesting and worth checking out so click the link and take a look at the male’s perspective on the “One”. For all my married folks out there I would love to hear about how you knew you met the one, so feel free to leave a comment sharing your experience! This entry was posted on October 30, 2011 at 2:26 am and is filed under Patiently Waiting...Sort of with tags Christian, dating, God, How to know you've met the one, marriage, Prayer, Relationships, Woman. You can follow any responses to this entry through the RSS 2.0 feed. Both comments and pings are currently closed. I recently got saved and I am only 21 but I am also waiting for the ‘one’ now. My only problem is I keep being approached by non-believers or just luke-warm christians. I am really trusting God for a man sold out for Jesus…my biggest temptation is to lower the bar just so that I don’t stay single because I really want to have someone in my life. Welcome to the family of God! My advice to you would be to focus on growing more and more in God. He knows the desire of your heart and will award you accordingly in due time. Beware not to get desperate and fall to temptation because the enemy sees the awesome plan God has for your life and he will do anything to destroy you including bringing the wrong relationships into your life. Seek God, pray every day, read your bible and get know God’s word. So when the enemy comes to tempt you, you will see his tricks a mile away and can tell him to kick rocks! Never lower your standards because God wants you to have the BEST and you will, just wait on Him to give it to you. I’m praying for you my sister! We met through friends and even though he had an instant attraction to me, my reaction was quite different. We became very good friends. After about a year and a half he started falling in love with me and I started to look at him differently. He was a person that really cared about me. We began dating, and I tried breaking up with him several times, but he wouldn’t let me, LOL. Needless to say we fell in love and got married – that is the short version. God is definitely a must to have a successful marriage. But I will say this, me and my husband were not who we are today 8/9 years ago. We both had a relationship with God but we were two young souls lost. I was a promiscuous, partying, rebellious teenager and he was a drug-dealing 20 something (who I would call to buy me beer). Neither of us was living a life that was leading to the beautiful life we share today. As a matter of fact I actually didn’t get the whole “Jesus” thing until AFTER we were married (but thank God I did). I encourage you to embrace all people that God brings into your life. Falling in REAL love with someone will open your eyes to many things. We both continue to grow as individuals, as woman, and man, as husband and wife, as mother and father. Growing is always happening so don’t disregard somebody based on how much faith they have today but how much love they have to share always. 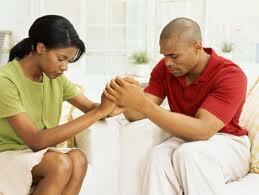 Prayer is powerful and God would not let you marry somebody that was not met to be your “One” have faith in that. My husband reminds me all the time that our relationship is a unique one and that not everyone’s will work out the same way. I get that, but I just believe that love and God can conquer all! Love your story! God bless you and your family. Together you guys have an awesome testimony of God’s love. Thanks for sharing! Patiently waiting for my “One,” but definitely keeping busy, in the meantime, pursuing God’s purpose for my life…serving children!!! Thanks for the comment! Keep doing what you’re doing. God will bring your “One” right in your path. Don’t stop busying yourself; it’ll give you guys tons of things to talk about when your “One” shows up! I will be short and to the point.How I knew that he was the one.one day many years ago I meet this man he called himself Garvey I was on my way to church upon bumping into him at first my heart and mind was saying no and asking do you really know me and what I want out of a man or relationship rolling my eyes and smh lol.I then said I have no time for this and went on about my business as I was. The very next day in the same spot was Mr. Garvey waiting for me with a smile on his face lol he then said hello my name is Garvey what’s yours I then said with a straight look on my face my mother doesn’t allow me to talk to strangers he then said how old are you I said dont push it .laughing together he then said I like you can. we get to know each other a lil better so I said and planned to meet again. The next time met with him I invited him to church he came and had a good time we continued to seeing each other then one day I said to him I would like for you to meet we planned and the day came he met my lil angle Aaliyah at that time she was only 2 years old he feel in love with her as time begin to fly by and we became more close he then asked me if he could meet my mother I then said yes wit a joyful smile on my face knowing if any man ask to meet your parents it then means something good I was very please and again I said lets plan. Garvey came and he met my mom they talk and talked about how he should treat me cause I came from a Christian home my mom then granted him permission to continue dating me, my mom was very strict and dont play no game, Garvey had to come and leave at a sedentary time.months turned into years until one day Garvey said to me I wanna see your mom I then said okay not knowing what was going to happened he came and ask my mother for my hands in marriage ,my mom then gave her blessing but made Garvey promise to take good care of me now it was time to plan my wedding alot of people did not come and we did not have the dream wedding I have dreamed of but that was okay as long as we had each other that’s all that matters we got married on Dec-28-2003 and we are still married till this day. How I knew he was for me is cause I was praying to God to send me my husband, my friend, my lover who would not only take Casee of me but my lil angle Aaliyah as well.Garvey as passed the test he all and more of what I have asked for and I pray God continue to bless our marriage. For those young ladies waiting and wanting to know if and when Mr right come do what I did pray and pray God will answer you one good day but in the mean time enjoy yourself and look to God to send your husband or the man that matches your hands not your friends to show or direct you to him enjoy make it a great one. Thanks for the blog love! I pray that God continues to bless your marriage and family! As always prayer is the key!